All amounts are quoted in TT and US dollars. For purchases outside of Trinidad and Tobago please change the currency to USD by selecting US Dollars from the Currency drop down list at the bottom of the left column. Cost on Delivery (COD) - Available to Trinidad customers ONLY. Bank Deposit - to 321 Marketing, Account # 1001978, First Citizen Bank. 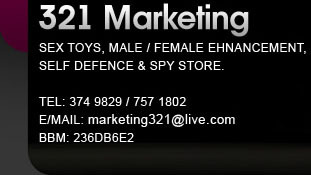 Postal Order - Payable to "321 Marketing". Western Union Money Transfer - Payable to "321 Marketing". This is aleardy included in prices.